Iran on Nov. 8 signed a $6 billion gas development deal with France’s Total. The South Pars gas field covers an area of 9,700 square kilometers, 3,700 square kilometers of which are in Iran’s territorial waters in the Persian Gulf. The deal is the first of its kind between the Islamic Republic and a Western energy firm since the nuclear deal with world powers took effect in January 2016. The deal for development of Phase 11 of the South Pars field must be finalized within six months, an Iranian oil ministry spokesman said. Total had reached a general agreement in 2004 with Iran for the development of Phase 11 and a gas plant. But it was never finalized. In June 2009 Teheran signed a nearly $5-billion agreement with China National Petroleum Corporation for the development of that Phase 11, but that contract was canceled in early 2013, after Iran said the Chinese side didn’t honor its commitments. The new agreement involves a consortium led by Total, which includes CNPC and Iran’s Petropars. 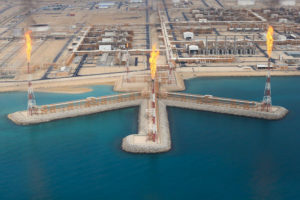 The offshore South Pars field, shared by Iran and Qatar in the Gulf, contains some 14,000 billion cubic meters of gas — 8 percent of the world’s known reserves.